Out of the grand total of 15,660 P-47 Thunderbolts produced for the US Army Air Corps during World War Two, perhaps the least known operational versions were the Curtiss-built P-47Gs. In order to meet expanded wartime production goals for the P-47D Thunderbolt, the New York-based Republic Aviation Company built a second plant in Evansvile, Indiana and also licensed the Curtiss-Wright Company to produce the aeroplane under the P-47G designation. Between December 1942 and March 1944 Curtiss-Wright produced a total of 354 P-47G Thunderbolts which were identical to the Republic-built "razorback" P-47D models. The P-47G was powered by a 2,300 h.p. Pratt and Whitney R-2800 18-cylinder radial air-cooled engine and could reach a top speed of 433 m.p.h. at an altitude of 30,000ft. The aircraft had a service ceiling of 40,000ft and a maximum climb rate of 2,750ft/min. With an empty weight of 9,000lb, a normal loaded weight of 13,500lb and a maximum weight of 15,000lb, the Thunderbolt was the heaviest single-engined fighter of its day. It had a wingspan of 41ft, a length of 36ft and a height of nearly 15ft. P-47G-15-CU No 42-25254 was contracted for in the 1942 fiscal year budget, and spent most of its military career as a fighter trainer in the western part of the USA. After the war, the Thunderbolt was used as an instructional airframe at Grand Central Airport in Glendale, California. In 1952, Ed Maloney obtained the aircraft and stored it at his home with the intention of eventually displaying it in his projected air museum. The Thunderbolt was finally reassembled at the Air Museum’s Ontario International Airport, California base in 1963 and took part in a number of west coast airshows until it was damaged in a forced landing at NAS Point Mugu, California, in 1971. Maloney then put the damaged aircraft into storage again until 1980 when it was restored to static display condition at the Museum’s new Planes of Fame location in Chino, California. Although the primary goal was to get the Thunderbolt back into flying condition, lack of a suitable replacement engine delayed that event until 1985. With the prospect of a new engine becoming imminent, Steve Hinton’s Fighter Rebuilders crew, together with museum volunteer workers, began bringing the Thunderbolt up to flying condition again in early 1985. In May they finally took delivery of a custom-built R-2800 engine from John Sandberg’s JRS Enterprises, a Minneapolis, Minnesota-based company which specializes in engine overhauls for warbirds. The engine is fitted with a Hamilton Standard propeller, which is reportedly more reliable than the aircraft’s original Curtiss Electric unit, and for which spare parts are more readily available. For increased reliability, Hinton’s crew also substituted TBM Avenger wheels and multiple disc brakes in place of the Thunderbolt’s original shoe brakes, and installed modern radio equipment. The aircraft’s starboard wing, which had been badly damaged in the forced landing at Point Mugu, was replaced with one from a postwar South American P-47D as part of a spare parts deal. To accommodate a passenger a jump seat was added behind the pilot’s seat. Over the years, 42-25254 has appeared in a number of different colour schemes. During the war, it carried the standard Army Air Corps olive and grey camouflage scheme which was changed to a yellow and black finish when the aircraft was at Grand Central. In 1963 the Thunderbolt was painted in overall olive (not accurate) and carried the markings of the P-47D that was used by 56th Fighter Group ace Bud Mahurin. In 1968, the aircraft was repainted in olive and grey camouflage and carried the markings of 42-26387 Miss Behave, a 78th Fighter Group P-47 in World War Two. 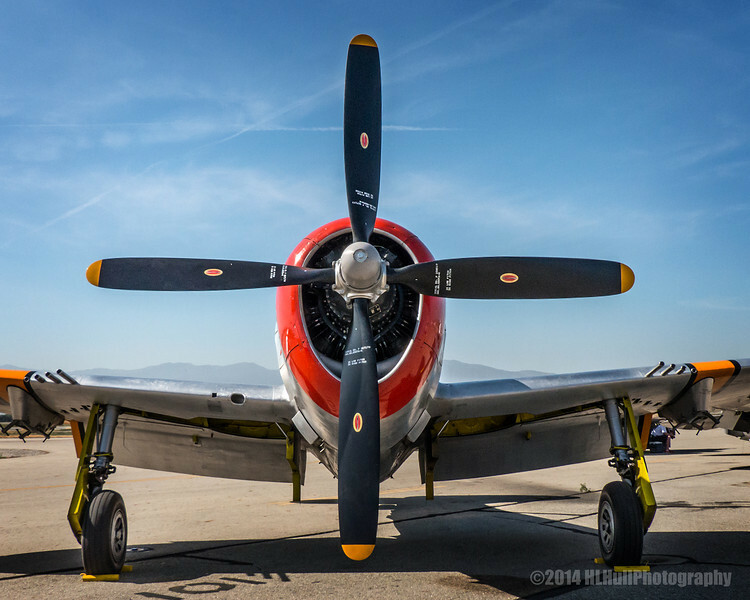 The Thunderbolt was restored to a natural metal finish in 1980 with the intention of eventually adding the markings of Penrod and Sam, the last operational P-47D which ace Robert S. Johnson flew with the 56th Fighter Group. However, when the Thunderbolt was finally restored to flying condition again, it reappeared in a very accurate paint scheme as 42-8487 Spirit of Atlantic City, N.J., Mahurin’s P-47D-5. Like the head on perspective! Terrific shot and I love this POV! Awesome comp and capture! Love the symmetry and colors! Great composition. I love the paint color scheme on this 'Jug'. I LOVE this symmetrical composition...so fantastic!